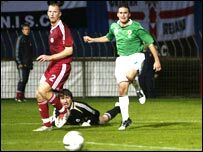 David Healy was Northern Ireland's hero again with his classy finish securing a deserved win in Wednesday night's Euro 2008 qualifier at Windsor Park. The home side dominated the first half but spurned a number of chances before Healy struck after 35 minutes. The Leeds United striker escaped his marker before slotting low into the bottom corner. Latvia posed more threat after the break with Maik Taylor blocking Girts Karlsons' close-range shot. The hosts took control after a frenetic start to the game and they were good value for their half-time advantage. Burnley teenager Kyle Lafferty wasted an excellent chance on 11 minutes when he failed to connect with Damien Johnson's pinpoint cross. It was the first of a number of occasions when the young striker lacked composure in front of goal. Latvia, fresh from a 4-0 victory over Iceland, posed little threat at the other end with Karlsons going closest with a tame header straight into the arms of Maik Taylor. Healy headed over from a Keith Gillespie cross on 32 minutes but the Leeds striker found the target three minutes later with a fine individual goal. A clever dinked header took the country's record scorer clear of his marker and he beat keeper Algksanors Kolinko to the ball before cooly slotting into the bottom corner. Lafferty and Johnson were off target with further openings as Northern Ireland pressed for a second before the break. Not surprisingly there was attacking intent from the Latvians early in the second half but they failed to deliver with the final ball. It was now an even contest but Lawrie Sanchez's side remained dangerous going forward and Healy's curling shot on the hour mark forced Kolinko to push the ball to safety. Aston Villa midfielder Steve Davis netted four minutes later but he was denied a goal by a debatable offside decision. Latvia created their best opportunity of the game on 74 minutes when Karlsons shot from close range but saw his effort blocked by Taylor with Jonny Evans finally kicking the ball clear. Sammy Clingan dragged an 81st minute shot wide in the last goal-mouth action of the match. Sanchez's side has now claimed seven points out of a possible nine and remain third in the group behind leaders Sweden and Denmark. Northern Ireland: Taylor, Baird, Craigan, Hughes, Evans, Gillespie, Davis, Johnson, Clingan, Healy (Feeney 90), Lafferty (Quinn 88). Subs Not Used: Carroll, Sproule, Jones, McCann, Capaldi. Latvia: Kolinko, Stepanovs, Astafjevs, Zirnis, Laizans, Kacanovs, Solonicins (Visnjakovs 85), Smirnovs (Gorkss 45), Verpakovskis (Kalnins 78), Karlsons, Pahars. Subs Not Used: Piedels, Ivanovs, Surnins, Grebis.